ST. PETERSBURG, Fla. — After running for 12 years at countless races -- admittedly sometimes for fun -- I would face one of my biggest running challenges yet: running over the Sunshine Skyway Bridge. (P.S. - I'm terrified of heights and I survived). 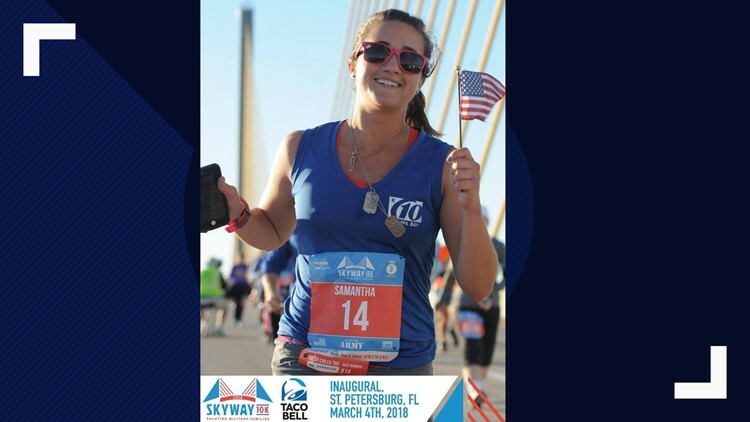 When I was given the distinguished honor to run the First Annual Sunshine Skyway 10K, I jumped (or ran) on the challenge in honor of my grandfather who had recently passed. He was an Army Ranger for 23 years, so it meant a lot to me that it benefits the Armed Forces Families Foundation. The over 180-foot, 4-mile-long bridge will again host thousands of runners on Sunday. 10,000, to be exact. While your heart is probably pumping in excitement (and also for nerves) and you're gearing up for the race, I decided to come up with 10 (hopefully) helpful tips to get you ready before, during, and after the race. 1. Hydrate, hydrate, hydrate. I'm talking before, during and after. Be mindful of your intake right before or during the race so you don't cramp, but one of the big things I've found is hydration can make all the difference in a race. Also, drinking plenty of water the day and even night before can help your body refuel for the race. One of the nice things to note is that there will be water available throughout the race via special spigots. 2. Catch plenty of zzz's. Especially two days before the race. Because let's be real, you likely won't sleep well the night before. Being well-rested and aware the day of the race will help you push for your best time. For recovery purposes, it benefits runners to rest up after the race and not overdo it. 3. Make sure to stretch. I promise, it's not just for looks. (Although, it can make you feel intense.) Stretching is helpful before and after your run, whether you're training or racing. It helps your muscles prepare for the long haul ahead of you and them and prevents injuries. I can't tell you how many times my physical therapist has warned me (and got onto me) about this. 4. Don't change your routine. "What do you mean, I don't normally run over the Skyway!" I get it, it's not something you do every day. In this case, I mean do the things you're used to doing before you run that help you. This could be eating a light snack, or not eating anything at all. Some (including myself) like to drink coffee -- some people can't stomach much of anything before the race. 5. Pace. Yourself. I know you'll be excited, but remember, it's a marathon, not a sprint. Well, in this case, it's a 10K, but still. Try to remember not to start off in a full sprint (unless you happen to be an Olympic runner and/or freak of nature) and try to find a pace you feel like you can maintain for 6.2 miles. You. Got. This. 6. Mentally prepare yourself. It's going to be a long haul. But if you mentally prepare yourself and go at your own pace, you'll make it through just fine. (Or at least you'll be happy that you finished and survived). I personally enjoy listening to pump-up music (with lyrics that I'm not allowed to write) and jamming out before I get ready for a race and it helps put me in the mindset to dominate (or at least just finish the dang thing). 7. EAT, EAT, EAT. Not like I have to tell you that three times, but still. You know that saying you are what you eat? Well, that sort of applies to what you eat the night and morning before a race. I'm sure a lot of you have heard of carboloading: just make sure you do it to an extent. While you want some of those simple sugars and extra carbs to get you going for the race, you don't want to feel weighed down either, especially right before the race. I would suggest pasta the night before and something lighter, like an energy bar such as a Cliff Bar and a banana, for the morning of the race. Make sure you're eating at least an hour and a half to two hours before the race. (As you can see, I can go on and on and on about food and eating). 8. Running shoes can make a HUGE difference. You don't want to get shin splints and you want to make sure you're performing at your best, so the right running shoes for your running type will help you achieve that. Running and shoe stores should be able to assist with that, especially if you're doing more long distance runs and/or races. Be mindful, just as you don't want to change your routine, you also don't want to wear brand-new running shoes the day of the race. You want to give yourself time to break in your shoes before the race. 9. Don't forget to take pictures. This seems like an oddly placed tip, but trust me, you don't want to forget to take photos. It's a pretty cool thing to be able to say you ran across the Sunshine Skyway Bridge, so you're definitely going to want to have pictures to look back on. It's a pretty cool freaking memory and Instagram post, if you ask me! If you take some cool shots, don't forget to send them to sendto10@wtsp.com and #sendto10! Also, don't worry too much about photos during the race, there will be photographers strategically placed along the course to capture your newest and fondest memory. 10. Just have fun. Just remember, it's not rocket science. I know it's so easy to psych yourself out before a race or worry yourself to exhaustion. Just remember that it's a fun and cool experience. Trust me, I was concerned with dealing with the height of the bridge before last year's race (I'm admittedly a scaredy cat with heights), but it's really not that bad or scary. It's a gradual increase and you feel like a superhuman being at the end! Keep up the good work, rock it, and make sure you smile and say hi to the 10News crew before, during, and after the race! Click here for FAQs on the official Skyway 10K website. You can follow 10News Digital Journalist Samantha Mitchell on Twitter and Facebook for more fitness tips and news.